The Carboy Dryer holds your carboys inverted after cleaning and sanitizing to let them drip dry. This sturdy stand is designed to hold a 3 5 6 or 6.5 gallon glass carboy in the proper inverted position for draining and complete drying. The mouth of the carboy is kept elevated away from moisture while the shoulders of the carboy are securely cupped by the molded plastic stand making it difficult to knock over. A great way to keep carboys dry and secure between uses. Stackable and top shelf dishwasher safe. 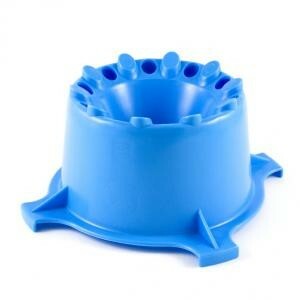 Made of sturdy vented plastic it has a reservoir center to collect the draining water. Fits 3 5 6 and 6.5 gallon carboys.